Early in ministry, I thought I had to have all the answers. I quickly discovered I barely had any answers. I possessed the Bible which has all the answers, but I lacked the personal experience and knowledge that were needed for certain situations. 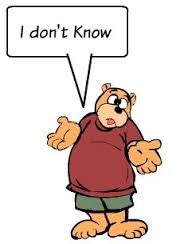 I have no problem now telling others that I do not know the answer. When I do not know the answer, I will often seek godly counsel. When I had issues in music ministry, I consulted godly counsel. When I ran into problems as a pastor, I consulted even more godly counsel. Those were days when I was treading uncharted territory, and I felt an extremely heavy sense of responsibility. The local denominational leader heard from me a lot during that year. Now that I have planted a church, I am reaching out to those who “know the ropes”. I am not seeking out the guys who have planted the fad churches. I look for those who understand that they are undeserving servants called by an awesome God. If you don’t know, admit it. Seek Scripture and wise counsel. Be prepared that God will call you to do something out of your comfort zone. But understand this – God has your best interest and spiritual growth at heart. ← Would You Join Me in Praying for Direction?